Richard is a guy who is clearly in the dog house of all dog houses, and now, the whole neighborhood looks like it knows about it. That's because good ol' Rich got outed by his own wife, who wrote a letter revealing he cheated on her. 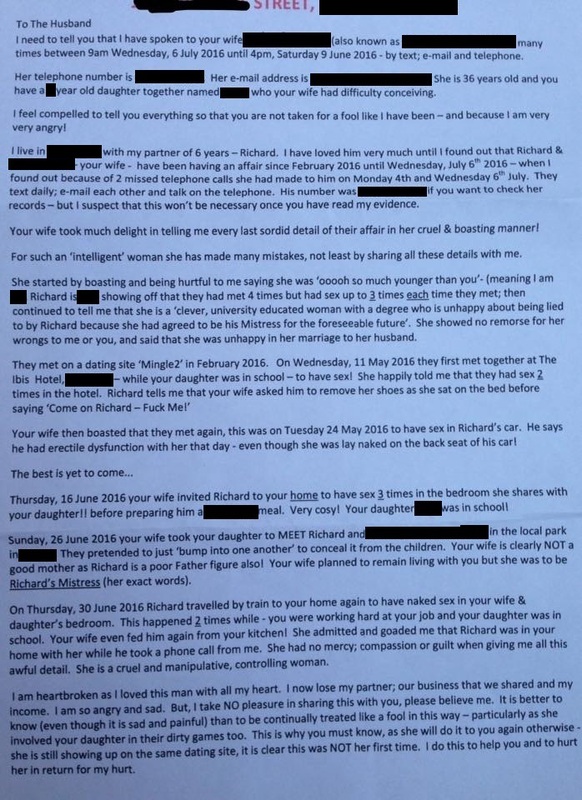 Not only did the wife address the letter to the husband of Richard's mistress, but it also looks like she made copies of that letter for other neighbors to read. And how do we know this? We know because 22-year-old Georgia gave TheLADBible the details and said the note was left in her mailbox. I wouldn't open someone else's letter. I was so shocked to receive it and don't know what to do with it. Although, I did find it hilarious at the same time. Well, obviously, the first thing you do is go to your Facebook page and share it, which is what Georgia seemingly did, according to TheLADBible's photo crediting. What's worse -- for Richard, at least -- is Georgia wasn't the only one who received the letter. TheLADBible asserts "loads of people" in the neighborhood have been seen with those notes. Clearly, no effort was spared in sharing Richard's infidelity, and he is definitely sleeping on the couch now, if not worse.